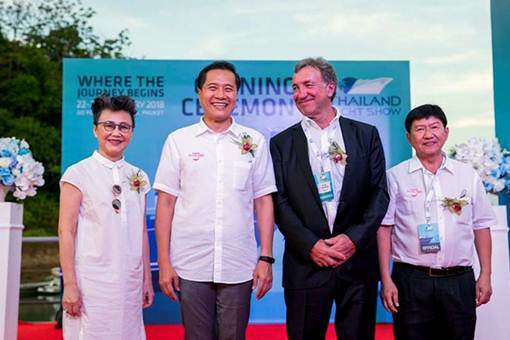 Mr. Weerasak Kowsurat, Minister of Tourism and Sport of Thailand together with the Deputy Ministers and Mr. Andy Treadwell were taking photo at the Thailand Yacht Show 2018 Opening Ceremony. Mr. Aphiwat Wutthinansurasit, Chief Operating Officer of EA Mechanics warmly greeting and talking with Mr. Weerasak Kowsurat, Minister of Tourism and Sport of Thailand. 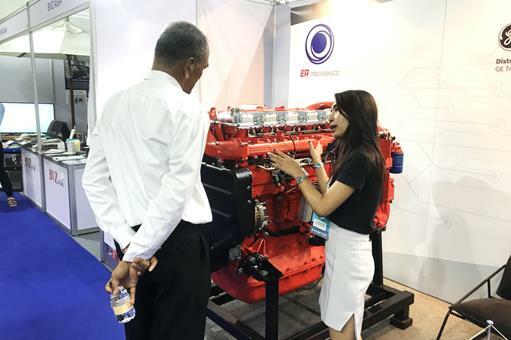 On 22nd – 25th February 2018 – Yachting with Confidence, EA Mechanics Company Limited was exhibiting in the 3rd edition of Thailand Yacht Show 2018 at AO PO Grand Marina, Phuket, Thailand. 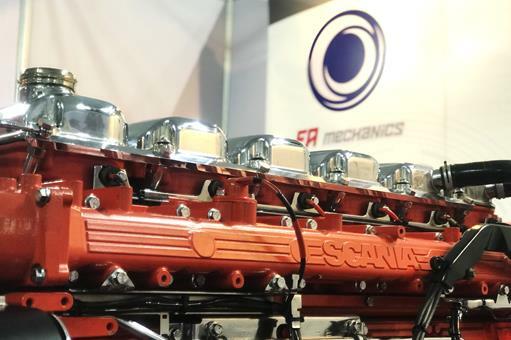 EA Mechanics aims to promote new distribution line of brands such as Scania, GE Transportation and Deutz. 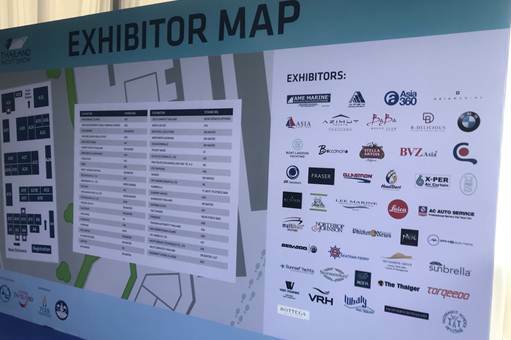 The location of the main registration point and main exhibitor listings backdrop at the Thailand Yacht Show 2018. 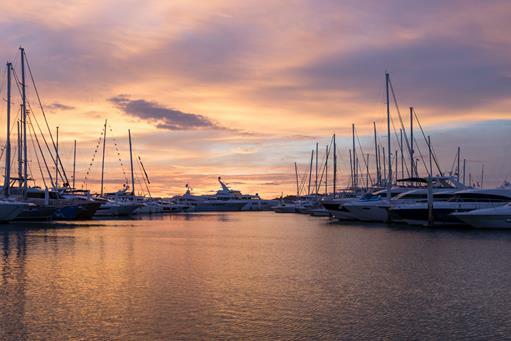 The sunset behind the sea of luxurious yachts attending this year’s event. 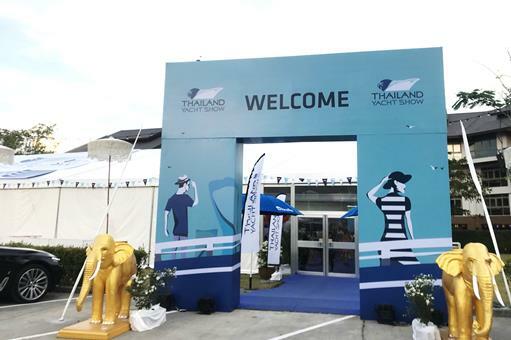 Surrounded by sea views and blue skies, this year’s 3rd edition of the Thailand Yacht Show 2018 held again to encourage and stimulate the economics of maritime tourism in Thailand by following government policies to support every kind of tourism to be known worldwide publicly. Furthermore, this exhibition was led by Tourism Authority of Thailand (TAT) and the Ministry of Tourism & Sports (MOTS), allowing the Thailand Yacht Show to be organized by the luxury lifestyle brand, Verventia, also known as owners of the Singapore Yacht Show, which also honours the show’s patron and guest of honor, Minister of Tourism and Sports Mr. Weerasak Kowsurat together with the Deputy Minister of Tourism and Sports. 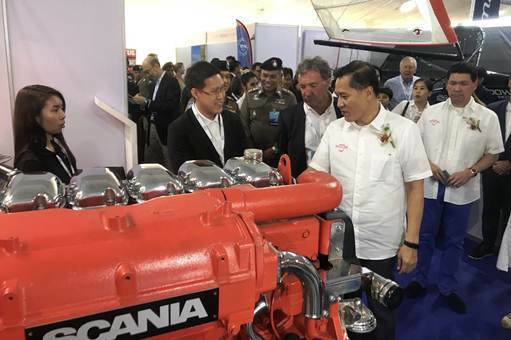 Scania Marine Engine model DI13 powered 580 hp. as the highlight of EA Mechanics booth. 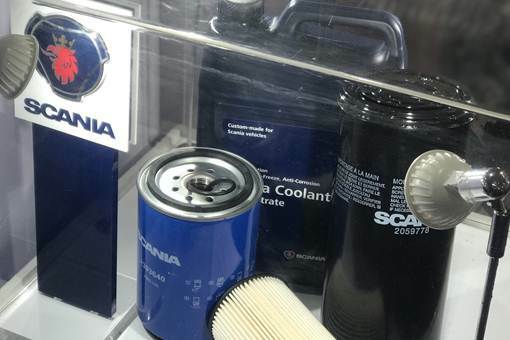 Scania genuine parts were displayed. Visitors were enquiring and interested in our premium Scania engines. EA Mechanics attended this year event the third consecutive year. Displaying the premium Scania engine model DI13 powered 580 hp. and qualities genuine parts from Scania as the highlight. Promoting all distributed products and services, included providing engines information to all visitors. As we partnered up with well recognized worldwide brand GE Transportation, Deutz and Scania in 2017 and is well committed to providing the best quality of goods and services to the public. We are ready to serve our customers with best ranges of diesel engines, genuine parts and service with highly trained skilled technicians and engineers to give the customers the services needed. We would like to take this opportunity to thank you all our visitors for visiting our booth. Definitely, appreciate very much for the every kind support and trust from our loyal customers.